I recently had the opportunity to visit Kingston Olive Oil Company for a cooking demonstration and to speak with owner Shaun Finucane about his family’s unique business and the experience that he offers to his customers. 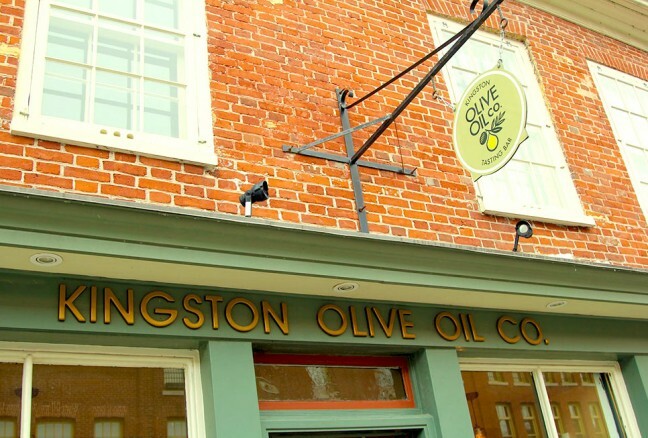 Opened in May of 2013, the Kingston Olive Oil company was founded after Shaun and his wife Julia were inspired to open a business after visiting a tasting bar during a trip to Saratoga. “My wife and I love food and travel. We’re active. 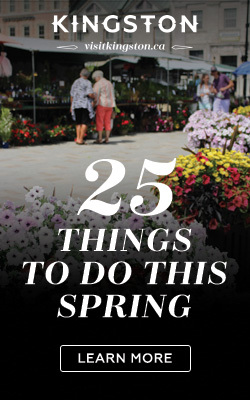 We enjoy healthy living… We thought this would fit really well in Kingston”, said Shaun. 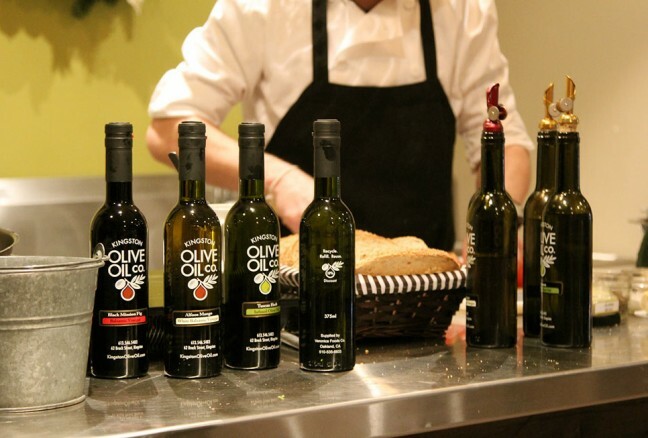 I agree with Shaun: Kingston Olive Oil Company is a great fit for Kingston, providing customers with a one-of-a-kind tasting experience backed by great hospitality. The street view of Kingston Olive Oil Company. Upon entering the store, I was immediately greeted by Shaun and his knowledgeable staff. He was kind enough to walk me through his store and explain some of the unique attributes of his olive oils, which come from artisans and farmers from around the world. Oils are imported seasonally, according to the crush date of the olives, ensuring that customers receive only the freshest oils. 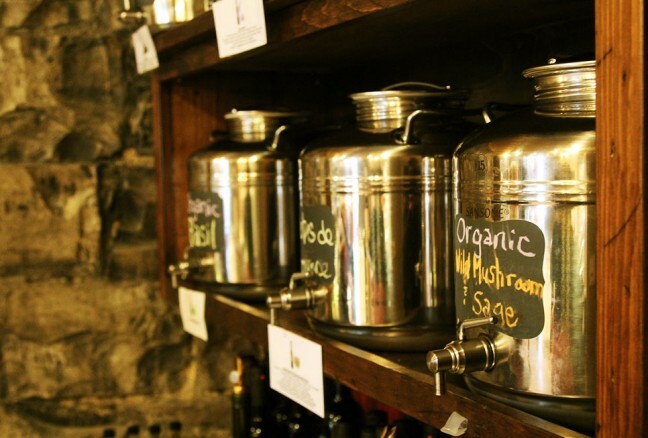 The selection of oils and aged balsamic vinegars offered at the Kingston Olive Oil Company are inspired by flavours from around the world. Decisions, decisions… there are a ton of varieties to choose from! Sampling is encouraged, and much like various flavours of wine, the oils and vinegars all possess unique defining characteristics. Shaun taught me how to taste the oils correctly, demonstrating the two methods used to experience the full body of flavour that the oils have to offer. The first method—and the one I found to provide the full range of taste— involves putting the olive oil in a sample cup, heating it with your hands, and then swishing it around before swallowing it. For the second method, Kingston Olive Oil Company also provides bread from Pan Chancho (including a gluten free option) for customers to dip in Olive Oil for sampling purposes. One of the many flavours that I tried is an award-winning Picual extra-virgin olive oil from Australia that earned itself the “Best of Class” award at the 2013 New York Olive Oil Competition. It had prominent grassy, herbal notes with a touch of bitterness that provided for a truly complex flavour. 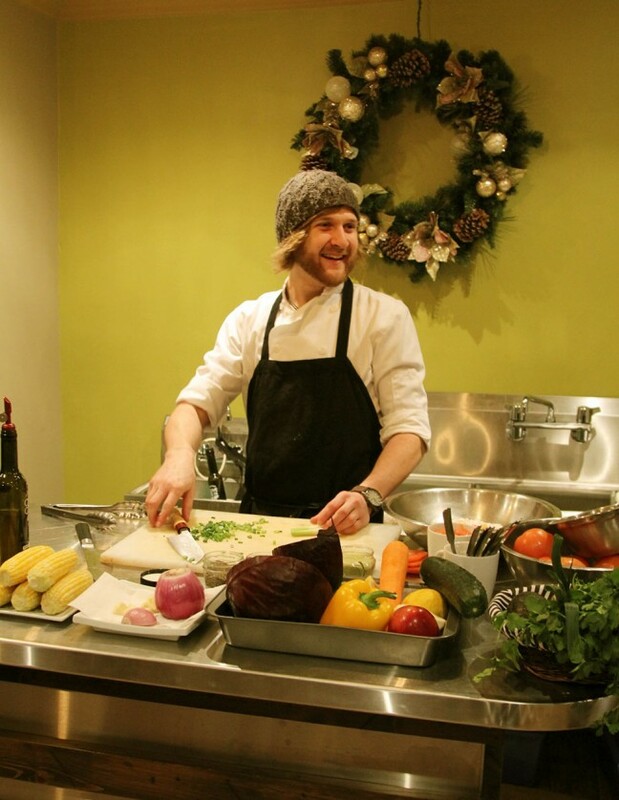 On the day that I visited, the Kingston Olive Oil Company was hosting a free cooking demonstration by Sous Chef Eric Brennan from Le Chien Noir, one of Kingston’s many fine restaurants. 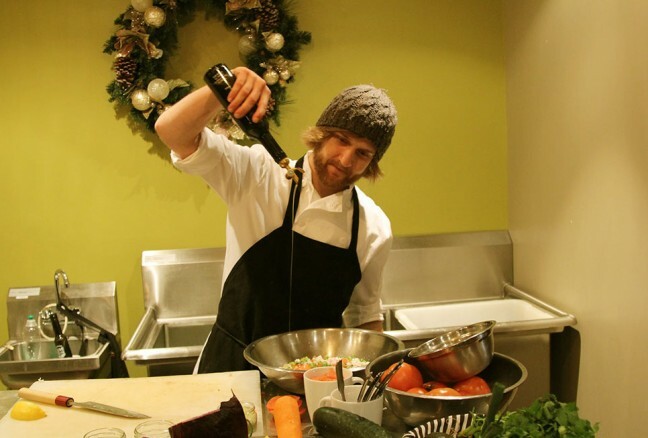 Cooking demonstrations are a regular occurrence at the Kingston Olive Oil Company, and are a great way to spend an afternoon. The store was packed during the demonstration, and several people that I spoke to mentioned that they were regulars at the store. During the cooking demonstration, Chef Brennan used several varieties of olive oils and balsamic vinegars to create an assortment of party snacks that I could see myself serving to guests. There was even a tasty punch made up from Perrier and Apricot balsamic vinegar. A little Persian Lime oil to provides a citrusy undertone to an Italian classic: bruschetta! Don’t forget the jalapeno salt, Black Mission fig balsamic vinegar or Alfoos Mango white balsamic vinegar, all available at Kingston Olive Oil Company. First on the menu was a bruschetta that made great use of the Persian Lime oil to provide a citrusy undertone to an Italian classic. Followed by that, the Chef demonstrated how to make a corn salsa with a guacamole dip. Lastly, coleslaw was served up that made great use of several of the oils. 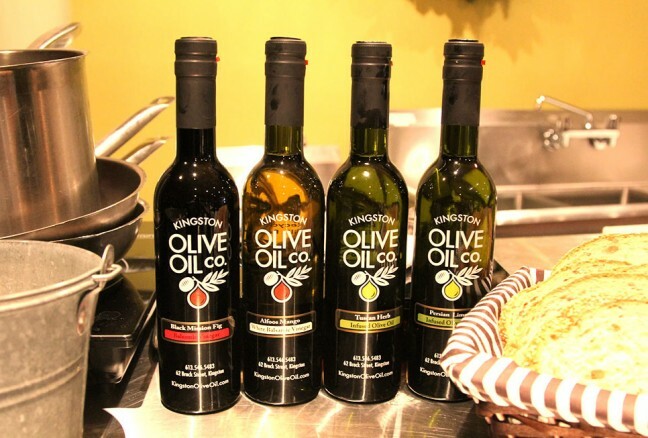 The demonstration made use of a wide range of products available for purchase at the Kingston Olive Oil Company, including jalapeno salt, Black Mission fig balsamic vinegar, Alfoos Mango white balsamic vinegar, Tuscan Herb olive oil, and Persian Lime olive oil. I highly recommend visiting Kingston Olive Oil Company. It was a fun and interesting experience made truly memorable by Shaun and his friendly staff.